The fully-equipped accommodation at the Cliffs at Peace Canyon leisure hotel includes comfortable, spacious, one- and two-bedroom units. The hotel is conveniently situated less than ten minutes from the hustle-and-bustle of Las Vegas centre, a paradise for entertainment and gaming. Each unit includes a full kitchen, living room, bathroom and a full size washer and dryer and this hotel is perfect for business trips, getaways and a family holiday. There are also plenty of soul-soothing spa facilities just a stone's throw away, such as saunas and steam rooms, hot-stone massages, Swiss showers and holistic treatments. From buffets bursting with cuisines du jour, a Las Vegas tradition, to more intimate dining experiences, there is also a wide range of culinary experiences to enjoy. 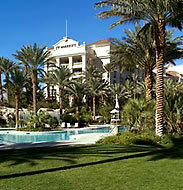 For golf fans, and not least for shopping fans, Las Vegas is also a popular holiday destination. 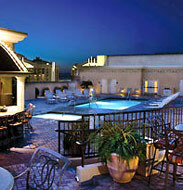 The Cliffs at Peace Canyon leisure hotel belongs to the WORLDHOTELS First Class Collection. The Grandview at Las Vegas is an outstanding resort complex that fulfills every holidaymaker's dream of a Las Vegas vacation. Boasting spacious, fully-equipped suites, it in within easy walking distance of the new South Point Casino complex. Las Vegas is unsurpassed when it comes to spellbinding stage shows and extraordinary entertainment. The Grandview at Las Vegas is a member of the WORLDHOTELS First Class Collection and all of its 864 rooms are suites boasting a full kitchen, living room and Jacuzzi. The spacious, fully equipped one- and two-bedroom suites at The Grandview at Las Vegas are situated on the south end of the famous Las Vegas Strip and across the street from the South Point Hotel and Casino. From spine-tingling volcanic eruptions to pirate battle reenactments, the Las Vegas Strip and surrounding area offer entertainment opportunities for one and all. And there are slot machines, high stakes table games, blackjack, craps, roulette and even the very latest in video gaming, too. View our directory of elegant, top, exclusive leading luxury hotels in Las Vegas and select from some of most upscale four and five star hotels. Hotels de luxe 4 et 5 etoiles en Las Vegas, 4 e 5 stelle lusso hotel Las Vegas. Hoteles de lujo 5 estrellas. 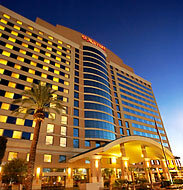 Featuring top luxurious hotel brands such as Inter-Continental Hotels, Fairmont Hotels & Resorts, Loews Hotels and more.